Paulette Meier is a singer/songwriter with a background in school-based training in violence prevention and social-emotional learning. Based in Cincinnati (OH), she came to her work with children after a variety of work experiences, from a teacher in inner city schools to working as a national organizer on nuclear issues. A passion to address the causes of disharmony at both the societal and personal level led her into social work, delivering mental health services to school children. She also became active in Re-evaluation Counseling (Co-counseling), a practice of mutual support involving emotional healing work based on an understanding of oppression. The songs on Come Join the Circle:LessonSongs for Peacemaking reflect Paulette's broad background of social activism and personal healing work. While living in Washington, D.C. in the early 1980s, Paulette was introduced to the People's Music Network, a national group of which Pete Seeger was a founding member. She began singing and developing a repertoire of songs about peace, justice and the earth. Back in Cincinnati, Paulette joined MUSE, a women's choir. This led to a 5 year collaboration with fellow MUSE member Ginny Frazier, with whom she produced the recording: Harmony for Social Justice. Exposure to and training from nationally known artists, such as Peggy Seeger, Si Kahn, and Bob Franke at summer music camps, helped bolster her confidence and skills in vocal performance and songwriting. The early 90s saw Paulette embark on a career in peace education as a traIner with Cincinnati's Center for Peace Education, an affiliate of Creative Reponse to Conflict (Nyack, NY). By 1994 she was working independently as a trainer/consultant in schools, helping teachers create peaceable classrooms through positive discipline approaches and training students and teachers in peer mediation, conflict resolution and other social-emotional learning skills and concepts. She expanded this work to Kentucky through the Peace Education Program in Louisville, as well as to Texas through the Travis County Health Department in Austin. As a trainer, Paulette discovered the important role that Quakers had played in development of the peace education movement and its core concepts. Several years later, she began exploring the Quaker faith and began attending a Quaker meeting regularly. "The more I learned, the more I appreciated the bedrock of spiritual belief and practice that Quaker peacemakers, abolitionists, suffragettes, and human rights activists over the years had been grounded in. The practice of inward seeking, leading to outward action, had nourished Friends for over 350 years, and I was drawn to it." Paulette now works a "day job" as substitute teacher in Cincinnati Public Schools, singing with students whenever possible. 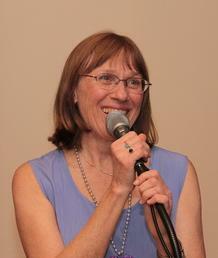 She is available to provide song programs for children at libraries, schools, after school programs, and summer camps. She also provides adult lecture/song programs for teachers on the power of learning through song and on peaceable classroom practices, as well as for adults interested in Quaker roots and spirituality. No matter the format, Paulette will entice you to sing along!! a different place for sure." "The songs -- melodic and catchy, but never preachy -- just might inspire your children to work things out." - Suelain Moy, Parenting Magazine. "Excellent content, beautifully recorded, well sung and played. I love the variety of styles." -Peggy Seeger, internationally known singer/songwriter and recording artist. "This CD has been a big hit at our house. Our children often reference the lyrics when facing a "less than peaceful" situation. It is a happy, uplifting way for them to deal with issues that would otherwise be painful or confusing." "These songs brought more joy to me and my students than I ever could have imagined." "These songs] open a doorway to a spirituality that can, in the words of the Quaker founder George Fox, 'shake all the country for ten miles round.' Her voice moves us into Gods heart, leaving us both challenged and comforted, and resting in a place of deep peace." Paulette Meier's rich voice, unforced singing, meditative pacing, and natural cadences bring the hearer to that inner peace where truth abides. This approach helps liberate early Quaker spiritual power for a new time. inspiring. I now frequently find them coming to mind on my morning prayer walks, which are richer for them."